Our previous hike was a true challenge, as we organised it on the 1st April which is April Fools’ day, we wanted to make this an extra enjoyable day for our hikers. One of our regular hikers suggested pretending that the bus broke down or that the restaurant ran out of food at top of Nagy-Hideg hegy during lunch, but in the end, we decided to do something less stressful and more fun (for the hikers). We thought that a fun game where the hikers were given facepaints and given the challenge of making the most creative artwork and taking adventurous pictures during the hike and uploading it to Instagram with the #budapesthikers hashtag. To motivate their creativity, we offered the lucky winner a free ticket to the next Budapest Hikers, hike! As you can see some of our hikers took the challenge pretty seriously! Tiziano was the randomly selected winner from all of our entries and he will now get to enjoy the next hike for free! During this hike, we hiked 18 km. This is a little longer than the usual distance of around 15km but according to the participants, it was an enjoyable challenge to go that little bit farther! The first part of the hike was the hardest section with some pretty long, steep climbs. Despite this, we always find that the motivation of food and beers at the top motivate everybody to keep going and hike with a smile (and a little bit of drool). This is what 55 hikers who just conquered Nagy-Hideg Hegy look like! 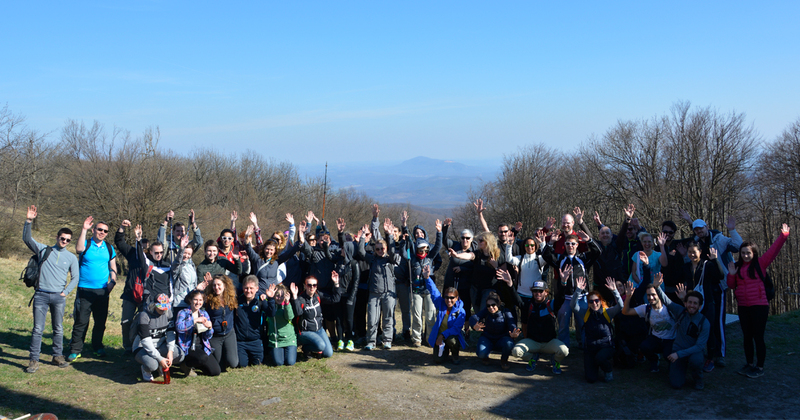 At our next hike on 29th April we are going to conquer the highest peak of Hungary standing proud at #1014 metres tall! If you would like to join us then please reserve your ticket here. It is going to be awesome! We promise!